Bargaining Update: We have reached an important agreement with the Administration regarding minimal NTT service, and language that allows for Senior Lecturer IIs to reduce their teaching workload. For details see here. We anticipate that bargaining will continue as of the start of the Fall 17 semester. We have also received confirmation from the Administration that the 14-17 contract will remain in effect until the new contract is agreed to (the 14-17 contract expired 6/30/17) with the exception of date specific raises (any new raises that are negotiated in the next contract can be retroactively implemented, if applicable). Get The Scoop! 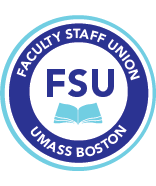 : The Classified Staff and Professional Staff Union will be having an informational meeting on Friday August 18, 12PM in the Ryan Lounge, 3rd floor, McCormack, about the budget cuts and possible actions around these. Feel free to attend: bring your bag lunch; free ice cream. Course Cancellations: We are hearing rumors about more course cancellations and cancellations that are problematic for students. Let us know what is happening in your department if you have yet to tell us, and please sign our petition here to get transparency in the budget and the budget cutting process, as well as faculty input on these cuts.